October 13, 2010 - Austrian Felix Baumgartner was scheduled to undertake a stratospheric balloon flight to 120,000 feet and attempt a freefall jump in an attempt to beet Colonel Joe Kittinger's record of 102,800 feet on August 16, 1960. However, Red Bull has reported it has pulled the plug on the Red Bull Stratos program due to a pending lawsuit against the company by promoter Daniel Hogan. Daniel Hogan filed a lawsuit in Los Angeles Superior Court in which he reports that in 2004, he went to the energy drink company, Red Bull, to pitch the idea "Space Dive" in which a skydiver would leap from 24.6 miles above the Earth to break a 50 year old record of Colonel Joe Kittinger. Hogan further stated that the project could generate between $375 million to $625 million in corporate advertising sponsorship. Hogan further stated that company executives prodded him for full details and then in an email on Oct. 13, 2005, the company told him they were not interested. "After a very detailed investigation of your proposal, we finally came to the conclusion that we would not like to continue our joint work on the space Dive project." Four years later, January of this year, Red Bull announced the ?Red Bull Stratos Dive? a mission to the edge of space. 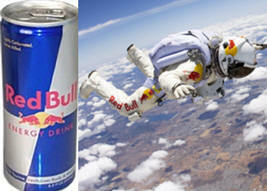 Hogan states that his outline of the "Space Dive" is the same as ?Red Bull Stratos Dive.? "Red Bull never acknowledged the plaintiff's role on Red Bull Stratos," nor has it offered to compensate him for his contributions or sought permission to use information that he disclosed in confidence, Hogan says. Hogan has sought in his lawsuit an injunction to halt the project and to seek punitive damages. Hogan and his company, Perdan LLC, are being represented by lead attorney Gretchen Nelson, with Kreindler & Kreindler of Los Angeles. Red Bull is an energy drink, it is an adaptation of the Thai energy drink Krating Daeng, which translates as "Red Bull". Based on market share, it is the most popular energy drink in the world. The company was founded by Thai national Chaleo Yoovidhya and Austrian national Dietrich Mateschitz. Together with his son, Chaleo owns a controlling 51 percent interest in the company however, Mateschitz is responsible for the company's operations through the Austrian company Red Bull GmbH. Red Bull's slogan is "it gives you wings" and the product is aggressively marketed through advertising, tournament sponsorship (Red Bull Air Race, Red Bull Crashed Ice), sports team ownerships (Red Bull Racing, Scuderia Toro Rosso, EC Red Bull Salzburg, FC Red Bull Salzburg, Red Bull New York, RB Leipzig) and celebrity endorsements. In 2009 it was discovered that Red Bull Cola exported from Austria contained trace amounts of cocaine. Red Bull has also been the target of criticism concerning the possible health risks associated with the drink. Captain Kittinger was assigned to the Aerospace Medical Research Laboratories at Wright-Patterson AFB in Dayton, Ohio. For Project Excelsior (meaning "ever upward"), a name given to the project by Col. Stapp as part of research into high altitude bailouts, he made a series of three extreme altitude parachute jumps from an open gondola carried aloft by large helium balloons. On August 16, 1960, he made the final jump from the Excelsior III at 102,800 feet (31,300 m). Towing a small drogue parachute for initial stabilization, he fell for four minutes and 36 seconds, reaching a maximum speed of 614 miles per hour (988 km/h) before opening his parachute at 18,000 feet (5,500 m). Pressurization for his right glove malfunctioned during the ascent, and his right hand swelled up to twice its normal size. He set historical numbers for highest balloon ascent, highest parachute jump, longest drogue-fall (four minutes), and fastest speed by a human being through the atmosphere. These are still current USAF records, but were not submitted for aerospace world records to the F?d?ration A?ronautique Internationale (FAI).